One thing I have not addressed yet which may seem obvious for my work with epigraphic texts is the subject of literacy. Of course, much has been written about ancient literacy by scholars far more expert than I, but as the basis of this project on social network analysis is epigraphic material, it seems remiss not to make my own views on the subject available. Only the aristocratic upper classes were learned and literate. Think Livy, Cicero, Tacitus and Vergil. The graffiti of Pompeii – i.e. vulgar Latin texts – were not written by the upper classes. The aristocratic class would not be responsible for non-grammatically correct texts, spelling mistakes, and generally poor Latin, nor would they write sexual or otherwise lowbrow content. T(h)iop(h)ilus canis / cunnu(m) lingere no/li puellis in muro. The question then must be asked, if the lower classes, of the sort who would make errors in their written Latin and engage in exchanging sexual jibes, were incapable of writing, then who wrote graffiti such as the one above? Here is my view (for what its worth): Whilst there are certainly varying degrees of literacy to be found, much as there are in any literate society, for the most part, the Roman world was literate on a level that was unparalleled until the modern era. Rome had, after all, a system that was based on professional and administrative writing. Laws, tax codes, calendars, trials, elections, and sundry other notices were posted publicly for all to see, not only in Rome but throughout the provinces. Dupont calls Rome ‘a civilization based on the book and the register,’ and rightfully so. Financial records of sales, leases, and property were kept on tablets. Archives of reports, magisterial actions, and court decisions were kept in administrative centres both in Rome and other cities. Aristocratic families kept their own records pertaining to ancestry, funeral orations, and other documents. Any family could be expected to have a small collection of writings containing tips on farming, remedies for illness, or prayers. Letters were exchanged with an incredible frequency, and there was even a postal system in place between provinces during the Empire. Possessing the time to write for leisure was viewed as an activity that showed a person’s wealth and standing in society. And I have not yet mentioned the public writing, the lapidary inscriptions on buildings, tombs, shrines, statues, and other edifices. 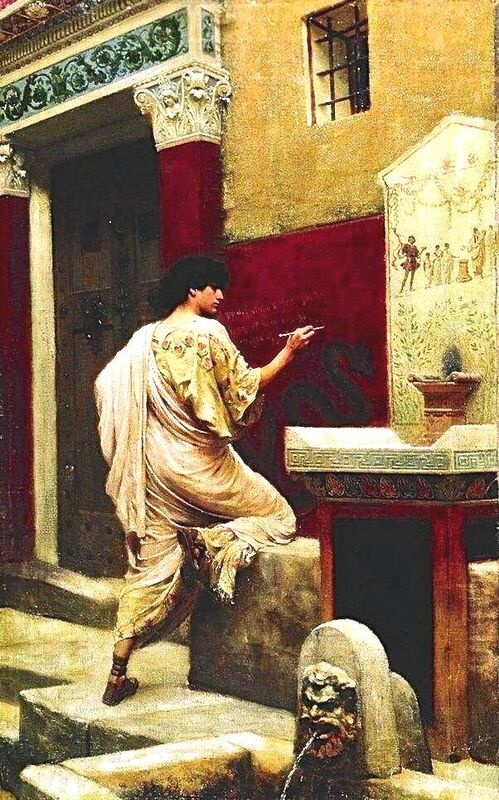 Finally, add to this the graffiti, the dipiniti, and other temporary writings, and ancient Rome becomes a place covered with words – words that were meant to be read by the majority of the populace. Νεόψηφον· Νέρων ἰδίαν μητέρα ἀπέκτεινε. Quis negat Aeneae magna de stirpe Neronem? / Sustulit hic matrem, sustulit ille patrem. Dum tendit citharam noster, dum cornua Parthus, / Noster erit Paean, ille Hecatebeletes. Roma domus fiet; Veios migrate, Quirites, / Si non et Veios occupat ista domus. Sed neque auctores requisiit et quosdam per indicem delatos ad senatum adfici graviore poena prohibuit. τὴν δὲ πλείστην αὐτὸς ὁ δῆμος ὁρμὴν καὶ φιλοτιμίαν ἐξῆψε, προκαλούμενος διὰ γραμμάτων αὐτὸν ἐν στοαῖς καὶ τοίχοις καὶ μνήμασι καταγραφομένων ἀναλαβεῖν τοῖς πένησι τὴν δημοσίαν χώραν. Impleantur elegeorim meae fores carbonibus. A quotiens foribus duris infixa pependi / non verita a populo praetereunt legi! One reason this is likely the case is due to the literacy rates of (modern) Europe. When Dante published the Divine Comedy in 1321, barely ten percent of the Italian population had the ability to read it. Only thirty percent of the adult population of the entirety of Europe was literate at the time Johannes Gutenberg invented the printing press. Statistics show that in the seventeenth century, men in France, England and Scotland had a literacy rate of thirty percent or less. A century later, this had more than doubled for Scotland (25% to 65%), doubled for England (30% to 60%), but increased at a far lower rate for France (29% to 48%). The first figures for female literacy do not appear until the eighteenth century, when England boasts a literacy rate of 37.5%, with France having 27%, whereas Scotland lags behind with just 15%. By the time of the nineteenth century, largely due to industrialisation and urbanisation, along with the start of the movement (at least in Britain) to educate all children, the literacy rates continued to climb with some regularity. What this means is this: in the eighteenth century, when Pompeii and Herculaneum were discovered and the graffiti came to light for the first time in seventeen hundred years, at least half (if not more) of the population of Europe was illiterate. Those involved in overseeing the early excavation and documentation of the sites (and thereby the texts), were educated, aristocratic, wealthy members of the European upper classes, who presumed, based on their own experiences, that the lower classes of Pompeii, like the lower classes of eighteenth century Naples, London or Paris, were illiterate. Wordsworth was, in a sense, ahead of his time in pointing out the fallacy of this type of judgement – one that would become a crucial aspect in the methodology of ethnographers and anthropologists in the twentieth century – the same standards, morals, or practices of one’s own culture cannot be applied when evaluating another. This, I believe, is exactly what happened in regards to ancient Roman literacy, whereas the evidence we are left, especially from a city like Pompeii, proves that this was a fully literate society, of proportions unrivaled until the modern era.